In Night Owl Cinematics, we strive to keep a balance between having fun and being professional in all our content that is being pushed out to our audiences. Our duty as a production house that concurrently owns a significant social media presence in Singapore is to not only provide content that are entertaining and engaging, but also to professionally convey messages in order to be responsible to our stakeholders. And here, we believe in making sure that every piece of content from us is of quality, and all of this is possible due to the staff that are working behind the scenes. Upon being a staff of Night Owl Cinematics, you will be responsible for the quality of work that you put out. You will be engaging with clients and stakeholders as a representative of the company and be trained to become familiarised and be largely involved with the operations of a production house/YouTube channel. And most of all, you will have a part to play in all the content that our audiences love and like. Videos are our bread and butter, and we believe that in order to make sure that every frame of a video has a purpose, a videographer is required to know how to edit and vice versa. A videographer is able to shoot with purpose only when he knows how to edit. And only when footages are shot with purpose, then an editor can piece all the footages into a meaningful and quality video. And in Night Owl Cinematics, the primary videographer is often also the editor of the video in order to retain the maximum amount of creative control he has over a video. An NOC videographer is required to make sure that he acquires all the footages that he needs during a shoot, and an NOC editor is required to have the confidence and technical skills to be able to produce a video from the start to the end with a leadtime of as short as 3 days. A video is not meant to only be viewed with the eyes, but also to be listened to. A sound engineer in NOC should be proficient with handling sound recording equipment from wireless microphones to boom microphones. He will also be required to be able to mix the tracks and make sure that each audio track is clear of any external ambience noise as much as possible. Also, he will be expected to be able to provide constructive feedback and recommendations in the event that the company wishes to upgrade its audio equipment. What makes NOC’s videos stand out are not simply just the cinematographer or how high definition they are. It is the fact that NOC’s videos are produced with the audience in mind. As such, in order to keep our videos as engaging and entertaining as possible, we put in our utmost efforts into our superimposed motion graphics. The motion graphics designer should be able to have a good sense of aesthetics and be able to work with the different editors of different segments to come up with the most appropriate yet engaging motion graphics. NOC is also currently exploring 3D animation and a motion graphics designer who is proficient with creating 3D animation is largely preferred. The social media manager of NOC typically works independently with little to no supervision, and his objectives are to utilise all the social media platforms under his fingertips to reach out to all the audience. He is also expected to have an excellent command of English and is able to generate his own daily bite-sized content from existing resources to engage with the audience. Being the mouthpiece of Night Owl Cinematics, he is required to be extremely professional when communicating with the public and be able to keep track of all the platforms that NOC utilises. All manners of operations require administrative work. The admin assistant of Night Owl Cinematics holds a very crucial role of making sure that the accounts and the paperwork are all nicely done. The admin assistant will have to handle quotations, invoicing, management of accounts, keeping track of jobs and may often be the first person to liaise with the stakeholders. He or she will also be largely involved in the operations of the company itself, hence this is not a position to be looked down upon. The staff that operates behind the scene are responsible in making sure of the smooth operation of the company as well putting out the content, but it’s the people who are in front of the camera responsible for making sure that the content sticks with the audience. It is also crucial that the talents are responsible and professional, and does not have a negative image. Talents should also be able to resonate with the vision of Night Owl Cinematics as well as being able to understand the audience. 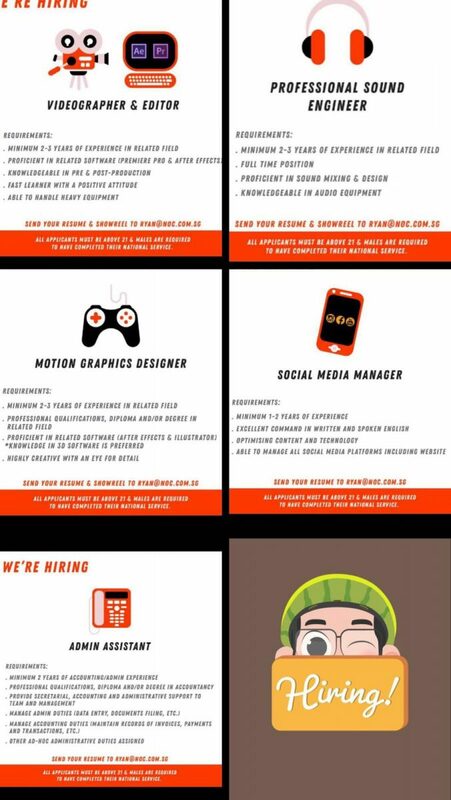 We are only accepting full-time applicants as well as interns.